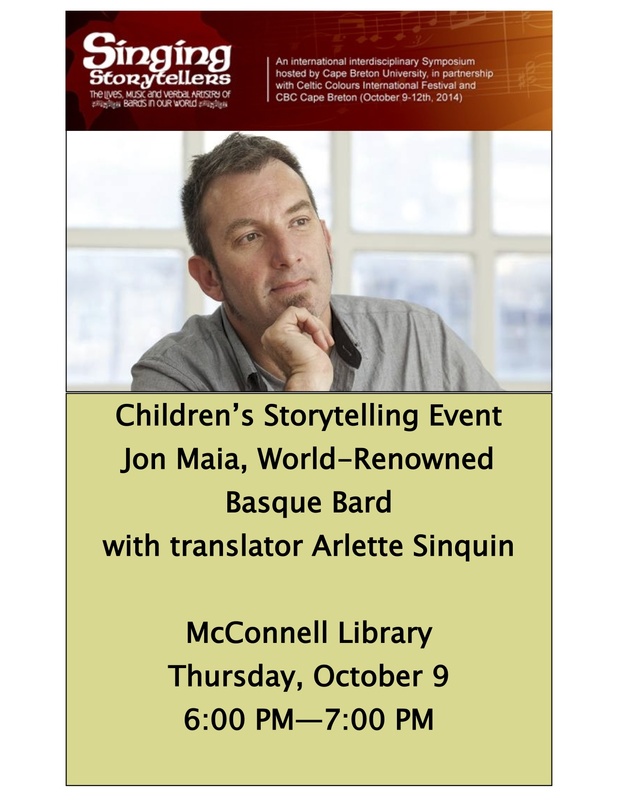 Everyone is invited to the James McConnell Memorial Library on Thursday October 9th, 2014 at 6:00pm for a very special Children’s Storytelling Event! Jon Maia Soria was born in 1972 and resides in Basque Country (Northern Spain). He is an author, a reknown Bertsolari (art of an improvisator-bard on any given theme), a musician and film maker. He started Bertsolarism 11 years ago at the school of Bertsolaris of his village – Zumaia (Basque country). His most recent prestation in a film was screened in the official selection at the San Sebastian International Film Festival. Jon has been 4 times finalist at the National Championship of Bertsolaris in his country. He has a degree in Philosophy and works as a translator. Jon has published several books on Basque culture, including children’s books, has made documentaries and writes the lyrics of various prominent Basque musical groups.